I was wanting to write something up about this, but in case I ran out of time (which happens all too frequently) here it is. Keen to hear your thought on it. 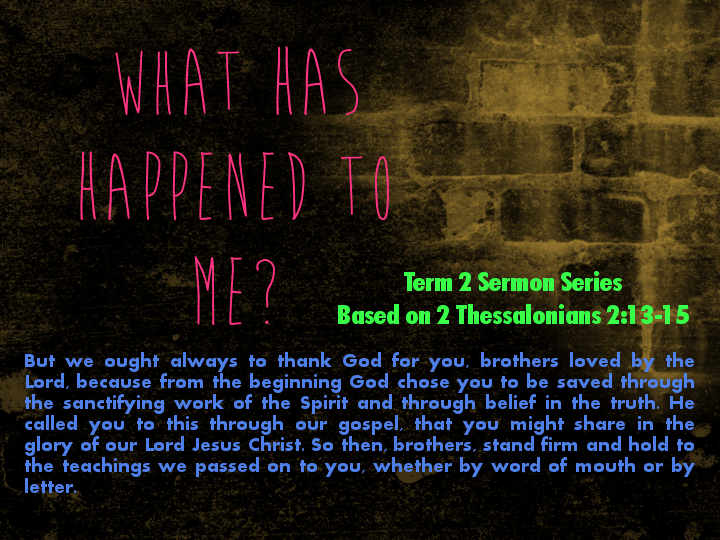 At St Luke’s, we’ve just started a sermon series called “What Has Happened To Me?” based on 2 Thessalonians 2:13-15. Preached at St Luke’s Liverpool on Sunday the 28th of April 2013. When someone makes you a promise, there’s a sense of uncertainty that follows. When they use the word “promise”, are they guaranteeing that it will happen just as they said? Or are they just using the word “promise” to lull you into a false sense of security, with no intention of actually having to follow through? I try to be a man who honours my promises. But with a memory like mine, it can difficult. If its not in my calendar or on my To Do list, the chances of me keeping my promise are reduced significantly. And some times I make promises that I have every intention of keeping, but afterwards it turns out situations outside of my control mean I can’t keep that promise. However, when Jesus makes a promise, he always keeps it. Because he is without sin, he never makes a promise he can’t keep. And because he is fully God, he is able to use his power to make sure nothing gets in the way of him fulfilling his promises. When Jesus promises that he’ll rise from the dead (Mark 8:31), he keeps it. When he promises that he’ll send the Holy Spirit (Acts 1:8), he keeps it. So when he promises a place in heaven for everyone who believes in him (John 14:2 – “In my Father’s house are many rooms; if it were not so, I would have told you. I am going there to prepare a place for you.”), we know he’s going to keep that promise. Jesus – the one who makes promises you can rely on.